I'm highly concerned about my Sonicare toothbrush. I absolutely love the thing. Thanks to the stellar job it does on my teeth, I can get in and out of the dentist office in a half hour. (It would probably be less than that, but my hygienist and I tend to talk a lot.) Bottom line is--the thing does an amazing job cleaning my teeth. However, lately it's been acting... well, possessed! In the middle of the night, it will suddenly turn on and wake us up with its vibrating madness. I was reaching for the alarm clock, trying to hit snooze--before I realized that was NOT what the noise was. After crawling out of the fog of deep sleep, we shut the darn thing off and stumbled back into bed, only to have it repeatedly go off again and again. We tried unplugging the charger and removing the toothbrush from the charger, but nothing was making it stop pestering us. Eventually, we moved the sonic demon to the back bedroom and shut the door. Problem solved. Although I could occasionally hear the incessant hum down the hall. This morning, I crept down that hall and opened the door to that bedroom. There on the floor was the offending dental device. Silent and looking like one of Santa's messed-up toys on the Island of Misfits. I took the thing back into our bathroom and oddly enough, the battery still had plenty of juice left, despite having run on and off most of the night. The thing works great. It just seems possessed at night. So, now I'll have to place a call to Sonicare to inquire about an exorcism, or preferably a replacement. Although, with my luck, I'll be just one day past the warranty period, which will force me to buy a new one. 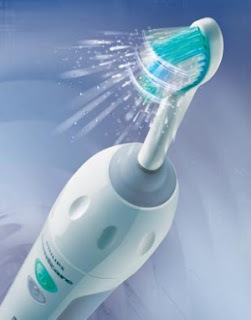 Have you had problems with a Sonicare toothbrush? Drop me a line!